Event Details & Online registration coming soon! Now in its 33rd year, Pasco EDC's Annual Awards & Trade Show is regarded as Pasco County's premier business event, attracting over 600 business and community leaders in Tampa Bay and Pasco County, including State legislators, county commissioners and city officials. The highlight of each year’s event is the Annual Industry Awards honoring local companies which exhibit exemplary growth in job creation, capital investment, technology, innovation, and community service. 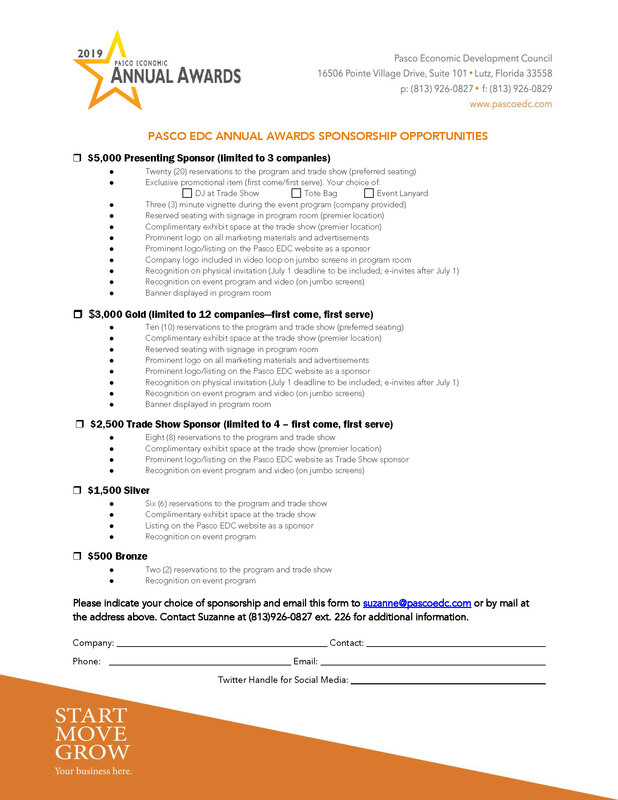 Pasco EDC is now seeking sponsors for the 33rd Annual Awards & Trade Show. If you are interested in sponsoring the event, please download a sponsorship application now. If you have any additional questions about sponsoring, please email Suzanne Renczkowski or call (813) 926-0827 ext. 226.